All CEW Foundation Board Members personally support Cancer and Careers. Having served at the C-suite level in the US Cosmetics and Beauty industry, Heidi Manheimer is the Chairman of the Board of Surratt Cosmetics, a luxury cosmetics brand, backed by 2x Partners, a private equity investor. In this capacity, she is leading the charge and building a team to grow Surratt Cosmetics into an established, prestige make-up brand. Continually breaking new ground, Heidi Manheimer was the first American woman appointed to the position of Chief Executive Officer for Shiseido Cosmetics America. Ms. Manheimer’s unsurpassed retail acumen helped in translating the over 14-year old legacy of Shiseido into a relevant and competitive brand within the U.S. market. Under her expert stewardship, the U.S. division of the Japanese cosmetic grant experienced continual year-over-year growth across all categories, including cosmetics, skincare and fragrance. Ms. Manheimer first joined Shiseido in September 2000 as Executive Vice President and General Manager. Within two years, she was promoted to President of U.S. Operations, a title she held from April 2002 until her appointment to CEO in January of 2006. During Ms. Manheimer's tenure, she played a pivotal role in deepening strategic relationships with retail partners and in growing Shiseido's business. Ms. Manheimer also led the company's digital transformation, driving e-commerce sales and the brand's social media presence. Prior to joining Shiseido, Ms. Manheimer was the Vice President and Divisional Merchandise Manager of Cosmetics, Fragrances and Apothecary at Barney’s New York. Always a visionary, Ms. Manheimer had an integral role in the introduction of several now-popular fragrance and beauty brands, including NARS Cosmetics, while at Barney’s. Ms. Manheimer began her retail career at Bloomingdale’s. Active in industry associations and charitable causes, Ms. Manheimer serves on the executive committee of Cosmetic Executive Women (CEW). Outside of the beauty industry, Ms. Manheimer is on the Board of Directors of Burton Snowboards and Herman Miller, Inc.
Carlotta Jacobson is a leader in the beauty industry. She has held a series of key positions including beauty editor of Harper’s Bazaar and her current role as president of the industry’s foremost association, Cosmetic Executive Women (CEW). CEW is an international organization of 9,000 individual members representing a cross section of beauty and related businesses. CEW’s primary purpose is to support the advancement of women in the beauty industry through programs that provide continuous career development. CEW provides unparalleled opportunities to network and gain industry knowledge through events, trend reports, industry newsletters, interactive workshops, and innovative industry leader talks. Carlotta Jacobson’s leadership, passion, and vision have established CEW as the preeminent organization it is today. During her tenure at CEW, Ms. Jacobson has led the organization through tremendous expansion—from fewer than 800 to over 9,000 members — developed a prestigious board of governors, and spearheaded the creation of unique programs including the annual Beauty Awards and the CEW Beauty Insider digital newsletter and website. In addition, she has initiated hugely successful partnerships with major beauty companies and retailers, notable among them the QVC Beauty with Benefits broadcasts showcasing prestige beauty brands whose sales benefits Cancer and Careers. A dedicated supporter of charitable activities, Ms. Jacobson is also president of the CEW Foundation, founded in 1993. She launched the foundation’s first independent initiative, Cancer and Careers, which is now 15 years strong and the recognized authority on work-related support for cancer patients and survivors. Ms. Jacobson was honored by the American Cancer Society for her commitment to supporting working women with cancer. In 2012, she received two awards: the CEW UK Achiever Awards 2012 Special Industry Award and Traditional Home Classic Woman Awards 2012 Editor & Publisher Award. In February 2014, she was named in WWD Beauty Inc.’s first-ever list of the 50 most influential people in beauty industry. She has served as chairwoman of Women In Need (WIN) where she currently serves as Chair Emeritus. WIN is a nonprofit charitable organization that provides housing and other vital services to homeless women and their children in NYC. Kim Kelleher is the chief business officer of GQ, GQ Style, Golf Digest, Golf World, Pitchfork, and Wired Media Group, which includes Wired and Ars Technica. Most recently, Kelleher served as chief business officer of Allure, Brides, Glamour, Self, and Teen Vogue. Prior to that, she was chief revenue officer of Wired Media Group. Kelleher’s career in media, marketing, and advertising spans more than 20 years. Before joining the Wired Media Group, she was president of Say Media. Previously, Kelleher was worldwide publisher of Time. During her tenure, she was named Advertising Age’s Publisher of the Year in October 2011. Kelleher also served as vice president and publisher of Sports Illustrated, where she was the first female executive to lead Sports Illustrated advertising sales in the history of the brand. Prior to that, she was vice president and publisher of Self and was inducted into the American Advertising Federation’s Advertising Hall of Achievement, the industry’s premier award for outstanding advertising professionals. Kelleher is active in many philanthropic initiatives. She is currently chair of the American Advertising Federation and serves on numerous boards including: New York Women in Communications, and the University of Wisconsin–Madison School of Journalism and Mass Communications. Kelleher is a graduate of the University of Wisconsin–Madison and resides in New York with her husband and two sons. Cristina is an accomplished entrepreneur who founded BioMedic (acquired by L’Orèal) and Philosophy (acquired by Coty). Cristina created Beauty Incubator Group (“BIG”) in 2012; BIG has supported next generation health and beauty entrepreneurs, including Vicky Tsai (Tatcha). Most recently Agnes Chapski was Publisher, Chief Revenue Officer of Allure magazine. Agnes recently joined NewBeauty in the newly created position of President overseeing the development of the brand and creating a new company called Beauty Engine. NewBeauty is the trusted beauty authority empowering women to make smart beauty decisions. Beauty Engine takes the powerful NewBeauty network of print, digital and multi-platform businesses (TestTube, Beauty DNA and NewBeauty Pro) and provides strategic solutions to companies seeking access, advice, beauty expertise and business services. Prior to NewBeauty, Agnes was Publisher, Chief Revenue Officer of Allure a Condé Nast brand devoted to beauty. Before joining Allure, she held Associate Publisher positions at Vanity Fair and Lucky since the publication’s launch in 2000. Before her distinguished career at Condé Nast, Ms. Chapski worked at Weider Publications, as Vice President, Group Advertising Director for all women’s titles and then as Vice President and Publisher of Jump. Ms. Chapski is a graduate of Smith College and resides in New York City with her husband and their two children. Lily Garfield got her start in the beauty industry behind the counter at Bloomingdale’s before graduating from Queens College, CUNY. After only three weeks of work she was recruited by LOVE cosmetics, one of the top beauty brands at the time, and became one of the first female Account Executives at the company. In 1974, Lily moved to Aspen for her love of skiing, and shortly thereafter she experienced one of life’s more serious challenges: a town without skin care in a climate of incredibly harsh winters and dry summers. In 1976 Cos Bar was created, and only new luxury brands in skin care were featured. The type of brands that discerning customers would only typically find at luxury department stores. Lily and her two sons moved to Vail in 1986, where she opened her second store, and in 1987 she moved back to Aspen. The success of these two stores, in two very special towns, caught the attention of the beauty industry leaders. In 1992, Leonard Lauder personally called Lily to open a store in Santa Fe, NM, due to a department store closure. Lily saw a niche in underserved internationally recognized communities, and a few more stores were opened over the years. In 2005, her son Oliver joined Cos Bar after attending Tufts University and spending a year at Bloomingdale’s 59th Street in their Executive Management Program. With Oliver’s help, a few more stores opened around the country between 2005-2007. In 2007, Lily was diagnosed with Peripheral T-Cell Lymphoma. She was treated successfully through a clinical trial at MD Anderson in Houston, Texas. During her absence, her son oversaw the demands of the company. In 2011, Lily was asked to curate Cos Bar inspired beauty products for the Shops at Target initiative. In 2012, these products were rolled out in all Target stores across the nation under the name Cos Bar of Aspen - The Shops at Target. In 2012, Lily was awarded WWD's Specialty Retailer of the Year". In 2013, Target again reached out to Lily to consult on skincare brands for their beauty department. Lily is thrilled to serve on the Board of Directors of the CEW Foundation/Cancer and Careers. She is also on the Executive Board of Visitors at MD Anderson. After 50 years she still skis and hikes in her spare time, and loves to play golf. She has proudly held the club championships at Maroon Creek Club in Aspen and Troon Country Club in Scottsdale, AZ. She also holds the women’s amateur record at Maroon Creek Club. Lily is the proud “nana” to four grandchildren. Cos Bar recently opened their 20th store, a true milestone of her life’s passion and joy. Laura Geller’s love affair with beauty began at an early age, a passion that led her to become a successful make-up artist, working under the bright lights of Broadway and behind-the-scenes with celebrities and socialites. It was Laura’s devotion to making make-up work for real women that led her to create her own beauty brand, believing that beauty is for everyone and should be uncomplicated, inclusive, and fun. 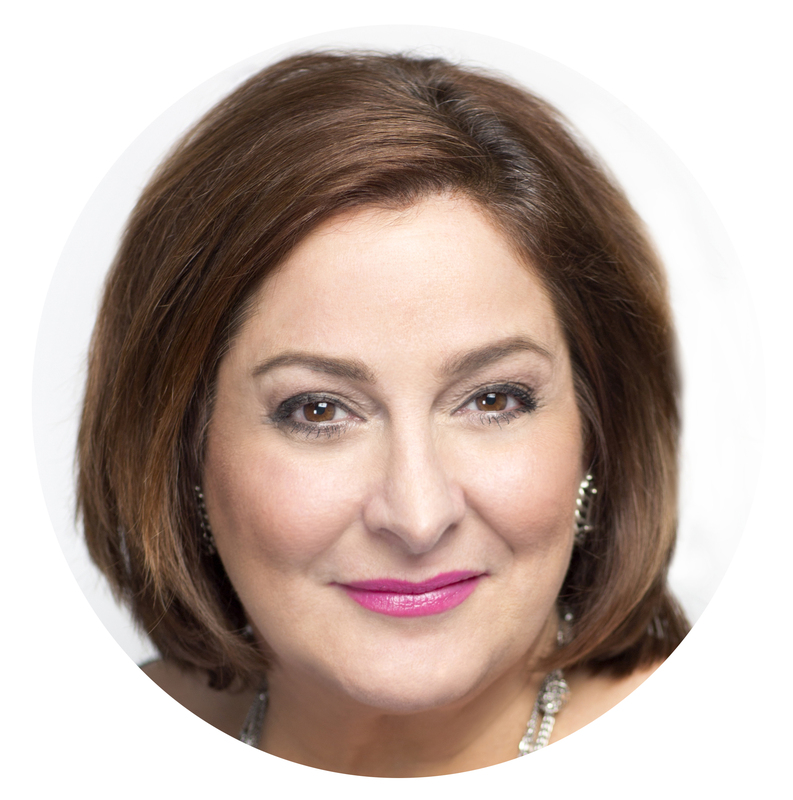 Since her very first appearance on QVC in 1997 and throughout the 20 successful years her Upper East Side make-up studio was open, Laura has used tips & tricks to translate professional application into techniques that work for all women, every day. She was a pioneer in bringing primer into every woman’s makeup routine and the Spackle® collection of primers has become iconic. She is also known for her collection of Baked cosmetics handmade in Italy – cult favorites of women for over a dozen years. In 2011, Laura was honored by the City of Hope, a leading research and treatment center for cancer and other life-threatening diseases, in recognition of her generous support of multiple cancer-focused charities. In 2012, Crain’s New York Business recognized Laura as one of the Top Entrepreneurs of the Year. Laura is also a recipient of the 2014 CEW Achiever Award. Born and raised in New York, she lives with her teenage son Daniel in New York City. Sonia arrived in New York as a wide-eyed kid from the Midwest, in search of her version of the American dream. She soon discovered the buzzing and unforgiving world of fashion, where her creative flair as a makeup artist, capable of transforming any face into a richly photogenic canvas, quickly established her reputation. But it wasn’t long before her brilliant eye for shape and color took her beyond being a top award winning makeup artist, to a respected beauty entrepreneur. Not only did she create her own performance-based formulas, she also designed packaging to showcase her luxurious, yet affordable beauty brand. Every season Sonia reinterprets the trends creating new colors, new shapes and patterns for brushes, bags and more. She transforms the everyday, making luxury fun, glamour accessible and beauty a reality. As a senior executive with 20+ years of experience launching and growing profitable and culturally-relevant media brands, Lucy Kriz is known as a trailblazer in the publishing industry. Lucy Kriz was named Chief Industry Officer of Beauty for Condé Nast in January 2017. In this role, Kriz oversees strategic category initiatives and advertising solutions, within the beauty category, across the Condé Nast portfolio. Kriz most recently served as publisher and chief revenue officer of W, beginning in 2012. In addition to posting W’s third consecutive year of revenue growth in 2015 and winning the Condé Nast Bronze Award for Business Performance in 2014, Ms. Kriz was also the recipient of the company’s coveted Collaborative Leadership Award for her partnership with editor-in-chief Stefano Tonchi. Under her leadership, W was named to Advertising Age’s A-List in 2016 and 2013, and the magazine was honored with a spot on Adweek’s Hot List in 2015. Kriz came to W from the Condé Nast Media Group, where as senior executive director she oversaw omnichannel sales across fashion, beauty, accessories, and other key categories. Previously, she was associate publisher at Details from 2009 to 2010 and, prior to that, corporate fashion director at Condé Nast Media Group, where she was named Corporate Salesperson of the Year in 2008. In 2002, Kriz joined the launch team for Teen Vogue as fashion and retail director. The brand received numerous awards during this time, including Adweek’s Startup of the Year. She was named Teen Vogue Salesperson of the Year in 2003 and 2004, and was honored with Condé Nast’s overall Salesperson of the Year Award in 2004. Kriz began her career in publishing in New York at Hearst with posts at both Harper’s Bazaar and Marie Claire. She earned a B.A. from Eckerd College. Diane Paccione has more than 30 years of retail apparel experience with a strong background in merchandising, marketing and product development. In January 2019, Diane joined bareMinerals as Vice President of Spa/Independent accounts. Prior to this, Diane was Founder and President of DPR Consulting, and was an in-house consultant for Shiseido Americas Corporation since February 2016. From July 2010 through March of 2015, Diane Paccione was vice president of jewelry and beauty merchandising at QVC. In this role, Paccione managed the company’s jewelry and beauty merchandising categories, responsible for developing strategic long-term plans and maximizing sales. Prior to QVC, Diane Paccione was president and chief operating officer at Deb Shops, Inc. where she was responsible for executing the company’s strategy, leading the management team and running the business. Paccione has also held executive management positions at Charming Shoppes, the May Company and Sears. Paccione earned a bachelor’s degree in Spanish from Queens College, Queens, NY. Jadzia Zielinski Tirsch is the Senior Vice President of Corporate Communications at Shiseido Americas, a regional division of Shiseido Company, Limited. Since 2016, Jadzia has led the company's corporate external communications, internal employee comunications, and its many philanthropic and charitable initiatives across the regions. A passionate communications expert, Jadzia joined Shiseido in 2002 as Vice President of Public Relations for the Shiseido and clè de peau Beautè brands. During her tenure, she helped to establish the public relations department as a key stakeholder within the brands, partnering closely with marketing and sales to integrate communications into a holistic brand-building business model which succeeded in driving awareness and sales of both brands in the U.S. market. Eventually Jadzia also assumed responsibility for media buying and creative services for both brands. From 2000 to 2002, Jadzia worked as an independent consultant for a variety of beauty brands including Ralph Lauren Fragrances, Dr. Eris Skincare and Beauty.com. From 1989 to 2000, Jadzia held various roles of increasing responsibility at Revlon, Inc. including Vice President, Corporate Initiatives where she left the company’s corporate sponsorships and philanthropic endeavors including the Revlon Run/Walk for Women. She also served as Vice President, Public Relations for the Revlon brand where she oversaw strategic communications campaigns for key franchises such as ColorStay and Age Defying with the company’s iconic spokeswomen, including Cindy Crawford, Halle Berry, and Claudia Schiffer. Jadzia began her career at L’Orèal where she held various roles within the Public Relations function for both L’Orèal Makeup and Haircare. As an enthusiastic supporter of the Foundation’s Cancer and Careers Program, Jadzia has led Shiseido’s sponsorship efforts for this initiative for more than a decade. Born in Poland, Jadzia is a (nearly) native New Yorker, who resides in Westchester County with her husband and two children. Conny founded her company and brand nügg Beauty (“The Face Mask Authority”) with the mission of providing prestige quality skin treatment products at affordable price points and backed by cutting edge technology. Before founding nügg Beauty, Conny was the CEO and President of Tweezerman International from 2006 to 2014 and is still on the company’s board. From 2012 to 2014 she also held the position of Member of the Board of Management of the Zwilling Beauty Group in Duesseldorf, Germany, overseeing the group's portfolio of beauty tool companies consisting of Tweezerman in the United States, QVS Global in Australia and China and Zwilling J.A. Henckels Beauty in Germany. Before joining Tweezerman International, Conny headed corporate development for the Zwilling J.A. Henckels AG in Solingen, Germany, and spent seven years with the international consulting firm McKinsey & Company with a focus on Sales and Marketing. She earned a doctorate in marketing from the University of Mainz and an MBA from the University of Cologne where she graduated as best in her class and held a scholarship of the German National Academic Foundation (Studienstiftung des Deutschen Volkes e.V. ), Germany’s largest and most prestigious organization sponsoring the academically gifted. Conny is passionate about product design and performance, and deeply committed to “wow-ing” consumers with beauty products they love. She lives on Long Island with her husband and two children.